Squinting through a dense cloud of smoke, I find my way to a seat on the far wall of the theatre. So focused are the performers, moving through the space to low vibrating sounds, that our entrance goes unnoticed. Only after the show do I realise how important these first few moments were: the audience softening their vision, preparing to let go of spectatorship and allow sensation to move between us and the performers. Admission Into The Everyday Sublime merges aesthetic and kinesthetic experience, translating the visual and sonic into sensation. The precise design of the space works to seduce the audience into the body of the work—four symmetrical plinths, two neatly piled cloths, the edges of the space invisible, borders erased by smoke. The performers, two female dancers and two male musicians, move with precision, each decision seemingly purposeful, yet abstract. Repetition gives the work a sense of ritual. In Separating Hydrogen From Water: A Primer, a Next Wave publication, Steiner writes: “There are words or sentences that I write over and over again, each time meaning something new to me.” This was evident throughout: persistent repetition toward the possibility of transcendence. The two men slowly rotate, a rock in one hand, the other palm open in a gesture of receiving; the dancers’ voices grumble into microphones. In another long passage, the two dancers prance and skip, tracing a long crescent shape, as if following the circuit of an equestrian track. With each repetition the actions become more expressive and the dancers’ attention deepens. The two men slowly lower the rocks towards the floor: as the music ceases the rocks are dropped in perfect unison; a small but resounding gesture. The two female dancers walk toward the rocks, arms across torsos, as if drawing bows, ready to release the dance. They dance with chaotic exactitude, a sublime unison. Loose limbs are tossed, the energy released reverberating through their bodies in unexpected ways. There are quick flicks of the hands, light elevation as weight transfers from foot to foot and legs swipe spiralling through the body. The sequence breaks briefly, the dancers re-positioning themselves each around a rock. Movement returns, delicate and fiery. In an earlier scene, warm light glows through the still-pervading smoke; two sources of light cast the dancers as silhouettes. Each man lies atop a long fabric sheath, the women pulling them along parallel lines. With only the outline of the bodies and cloth visible, the lighting removes the detailing of the bodies so we observe the weight slowly dragged. The space, lit by Matthew Adey, feels expansive; his signature minimalist style is essential to the transformation of the theatre. 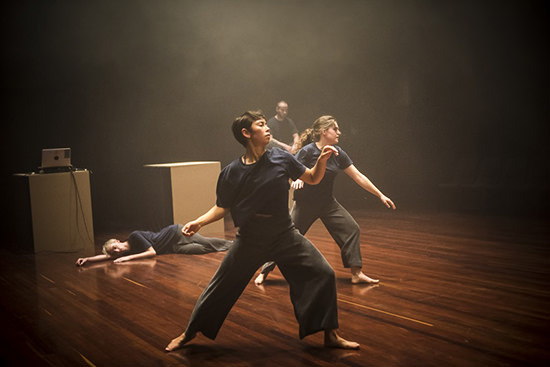 In the opening scene all four performers are moving in the space; intermittent duets, male and female. The relationships evoke transmission—of energy. The women, accessing a trance-like state, weave energetic pathways through the space, returning to the men to enact transmission—for example with a resounding slap to the chest. There is an emotionality and sensuality to the relationships, as in a kind of healing practice. Lilian Steiner lowers Atticus Bastow toward the floor, their legs intertwined. She stretches out her arm and firmly plants it on his chest. Then stillness: the transmission. She leaves. At the show’s climax the lighting shifts our attention to a large painting revealed at the end of the space. Its size and position suggest something almost sacred, an atmosphere of mingled terror and fascination. A deity summoned by the performance? The light on the painting alters in colour, transforming between organic and inorganic textures. These become felt sensations until white light reveals grey metallic paint, its ‘true’ surface. The sound grinds, loud motors burble, yet something about it feels animalistic, a purring rhythm. It seems a belief in the work’s potential for transcendence is vital, much like the importance of faith in spirituality and religion. In the first few moments, I decided to go with this work, to believe in the performers’ sincerity. Yet at times this was hard work. Did being positioned as outsiders on the edge of the performance space prevent fuller engagement? Although Lilian Steiner created a powerful sensorial experience, I wonder whether the work offered true admission into her cult of the sublime?